Dear Readers, Here we have given the important practice set questions on Reasoning Ability (Blood Relations), aspirants those who are preparing for the examination can also download in pdf and make use of it. Ravindra is son of Ashor’s father’s sister. Sahil is son of Divya. Who is the mother of Gaurav and grandmother of Ashok. Ankit is the father of Tanya and grandfather of Ravindra. Divya is wife of Ankit. 1).How is Ravinda related to Divya? 2).How is Sahil related to Ravindra? 3).How is Gaurav’s wife related to Tanya? 4).Pointing to a girl in the photograph, Balu said, “Her mother`s brother is the only son of my mother’s father.” How is the girl`s mother related to Balu ? 5).A is the son of B. 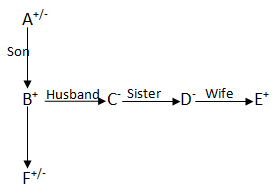 C, B`s sister has a son D and a daughter E. F is the maternal uncle of D. How is A related to F ? 6).If A + B means A is the brother of B, A x B means A is the wife of B and A % B means A is the daughter of B then which of the following means S is the uncle of P? 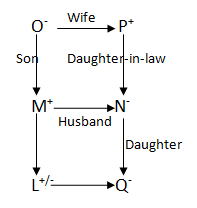 Directions (7 – 9): In a family of six persons L, M, N, O, P and Q, there are two married couples. O is grandmother of L and mother of M. N is wife of M and mother of Q. Q is the granddaughter of P.
7).How O related to Q? 8).How was L related to N? 9).There are two couples, who are they? 10).A’s son B is married with C whose sister D is married to E the brother of B. B is the father of F. How A is related to F? 11).P is the brother of Q. Q is the brother of R. S is the father of P. Based on these three statements, which of the following statements cannot be definitely true ? 12).A is the son of B.C, B’s sister has a son D and a daughter E.F is the maternal uncle of D. How is E related to F ? 13).Daya has a brother Anil, Daya is the son of Chandra. Bimal is Chandra’s father. What is Anil of Bimal ? 14).Rahul says that father of Ram father is my father, then how is Rahul related to Ram ? 15).Looking at the portrait of a man, Harsh said, “His mother is the wife of my father’s son. I have no brothers or sisters.” At whose portrait was Harsh was looking? 4. D)Only son of Balu’s mother’s father — Balu’s maternal uncle. So, the girl’s maternal uncle is Balu’s maternal uncle. Thus, the girl’s mother is Balu’s aunt. 11. D)P is the brother of Q and Q is the brother of R.
So, R may be the brother or sister of P.
His wife is mother of the person whose portrait is. So portrait is of his child.